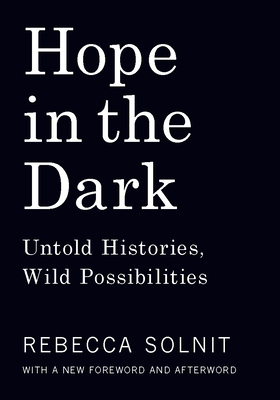 A book as powerful and influential as Rebecca Solnit's Men Explain Things to Me, her Hope in the Dark was written to counter the despair of radicals at a moment when they were focused on their losses and had turned their back to the victories behind them--and the unimaginable changes soon to come. In it, she makes a radical case for hope as a commitment to act in a world whose future remains uncertain and unknowable. Drawing on her decades of activism and a wide reading of environmental, cultural, and political history, Solnit argued that radicals have a long, neglected history of transformative victories, that the positive consequences of our acts are not always immediately seen, directly knowable, or even measurable, and that pessimism and despair rest on an unwarranted confidence about what is going to happen next. Now, with a moving new introduction explaining how the book came about and a new afterword that helps teach us how to hope and act in our unnerving world, she brings a new illumination to the darkness of 2016 in an unforgettable new edition of this classic book.